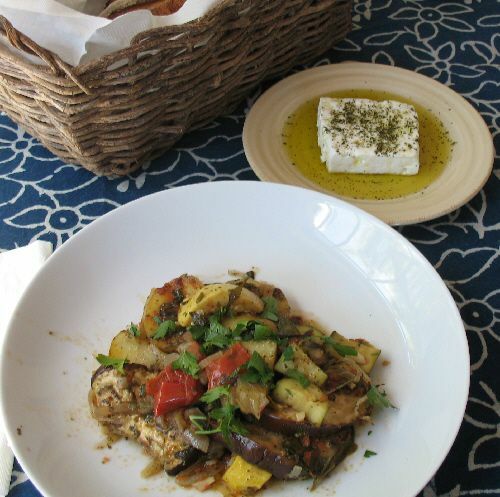 Greece is famous for dishes that feature fresh, ripe vegetables, and the summer bounty is the perfect opportunity to make some of her most well-loved dishes. Summer vegetables are roasted, stuffed, fried, boiled, sautéed, and eaten raw. The list of summer vegetables is long, and the list of fabulous dishes is endless, so I've pared the list down to ten of my personal favorites. This medley of oven-roasted summer vegetables is a Greek classic. Perfect as a meatless main dish, it's also a delicious side dish with grilled fish or lamb chops. Briam features eggplant, zucchini, potatoes, garlic, onions, and tomatoes, and Nikki's recipe adds the taste of cumin, cayenne pepper, and some artichokes (optional). Delicious! Briam is an easy dish to make and takes about one hour to cook. Almost always called "yemista" (or "gemista," pronounced yeh-mee-STAH) which means "stuffed," tomatoes, zucchini, peppers, eggplant, and even potatoes are fabulous choices for summer dining. Choose your filling - meat with rice, rice with herbs, rice with vegetables - there's a wide choice for all tastes. Stuff some of each vegetable, or pick one or two to match your preference. 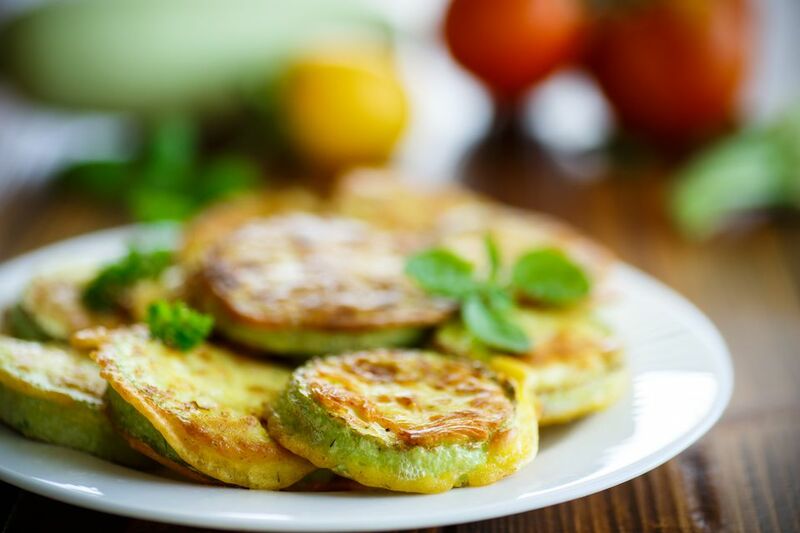 Celebrate the zucchini of summer with this recipe for zucchini fried in a batter made with soda water. The combination of thinly sliced zucchini, the lightest of batters, and hot oil, create a delightfully airy and crunchy dish. Serve as an appetizer, meze, or side dish. The focus is on the freshest of green beans and tomatoes for this simple, healthy, and delicious stovetop casserole. The recipe is from Thebes and calls for a touch of onion and garlic. Serve as a meatless main dish or side dish. Bell peppers are not the only peppers of summer, and this recipe is a great one for another type of pepper. It calls for bull's horn (or Anaheim or Cubanelle) peppers (long and tapered, light green in color, sweet), hot red peppers, and feta cheese. It is a specialty in the shadows of Mount Olympos, where it is served as a meze with a locally made spirit. Serve it as an appetizer, meze, or side dish. The recipe is quick and easy. Leeks are often overlooked, but they are tasty, beautifully green, with a distinctive taste all their own. This member of the onion family is used in many recipes with meats, but this rice side dish is one of my favorites - and easy to make. This is your chance to get those dark leafy greens to the table in a new way that appeals to diners of all ages! Spinach, Collard Greens, Amaranth (Vlita), Mustard Greens, Chicory... the list is endless. The recipe is easy and simple. The greens are drizzled with olive oil and topped with a squeeze of lemon juice. A very traditional Greek dish, Horta can be served as a main dish, side dish, or salad, and served hot, at room temperature, or chilled. Great for family dinners, picnics, and midnight snacks with a piece of feta cheese on the side. Dark leafy greens are summer vegetables, and wonderfully healthy. Spinach is perhaps the most-used leafy green, and spinach pie is always a favorite. This recipe is one of the easiest of the filled phyllo pies to make and calls for commercial phyllo sheets. Serve as a snack, a side dish, or even as a main dish. Save your ripest and most aromatic tomatoes for this traditional salad that showcases tomatoes and cucumbers (optionally, small peperoncini peppers). Summer vine-ripened tomatoes smell like tomatoes even before they are cut, so if you have unripened tomatoes on hand, wait until they ripen completely before making the salad! And to round out the list of my favorite dishes featuring summer vegetables, Moussaka, perhaps the most famous Greek dish made with eggplant. Moussaka is not a light dish, but it is definitely on the summer menu in restaurants and homes all over Greece... and in other countries as well. Layers of alternating eggplant and a ground meat and tomato sauce are topped with a decadent cream sauce. Not to be missed! Not a fan of meat? Try the recipe for a (lighter) Vegetarian Moussaka that highlights eggplant, zucchini, and potatoes. What are Greek Recipes for Thanksgiving?